Ask a Travel Agent for Assistance - we are itching to help you! Don't believe the movies - most New Yorkers don't shout "TAXI!" when hailing a taxi cab (just stick an arm out) & aren't travelling in taxi cabs anywhere as much as portrayed, most New Yorkers never see mob hits in the streets & don't stay in huge apartments. For accommodation in New York we recommend the Casablanca Hotel Times Square, which is obviously in a very good location (a walk outside the hotel door takes 30 seconds to get to Times Square). Street side rooms are noisier, but have more of an open feel to them - the higher the better. Joburg to JFK is a brutally long flight (the 8th longest commercial flight in the world), but buying a cheap ticket eases the pain somewhat. In February 2014 the US Government set up a border post in Abu Dhabi, thus allowing passengers to have security screening done whilst in transit, and making it a LOT more advantageous to fly with Etihad Airways. The way to make sure that you get on a cheap flight from Johannesburg to New York is by comparing the prices of the airlines & seeing which flight is cheapest (only South African Airways flies direct, landing at JFK, but they're not usually cheapest). Most international flights land at JFK, but some do fly to Newark Liberty International Airport (LaGuardia Airport is used mostly for domestic flights). Here's an Emirates A380 landing at JFK, with Captain Abbas Shaban talking us through it. 2013-07-20 Readers of Frequent Business Traveler have named John F Kennedy International Airport as being the best in North & South America, in their GlobeRunner awards. Take the JFK AirTrain to a metro or rail station, and then onwards to Manhattan. Take an MTA NYC Bus, which leave from a ramp near Terminal 5, to a subway connection and then the subway to Manhattan (the cheapest way of getting there, but the buses don't have much room for luggage and sometimes stop in rough neighbourhoods). 9 February 2015 : The third week of heavy snow storms is hamering flights to and from New York and Boston. Both South African Airways and Delta's flights scheduled for later today are still departing despite the fact that over 1500 flights have been cancelled. 9 March 2014 : South African Airways restarts its non-stop flights from JHB to New York. During South Africa's summer months SAA flies from OR Tambo to New York via Dakar. 2 March 2014. Cathay Pacific commence flights to Newark; creating 1-stop options from Johannesburg to Newark via Hong Kong. 27 October 2013. SAA introduces a refuelling stop in Dakar, on its flight SA203 from Johannesburg to New York (SA204 remains non-stop). 9 July 2013. Delta now allows 2 pieces of checked-in luggage. 1 June 2013. Etihad switches from an A340-500 to a Boeing 777-300ER on the Abu Dhabi to New York leg of its Johannesburg to New York flights, improving capacity by 37%. The plane is wifi-enabled. 9 March 2013. Fatoumatta Kaba, a seventeen-year-old wife of a Gambian diplomat, gives birth on a South African Airways flight from Joburg to New York! Luckily there was a nurse & 2 doctors on board the flight to assist. “I wasn't scared to have the baby, I was very happy,” said Kaba. 8 February 2013. SAA, BA & Virgin Atlantic cancel a number of flights to New york, as a result of a blizzard in the US. October 2012. Virgin Atlantic's Clubhouse at Newark Liberty Airport opens. For Upper Class passengers, the "Newark space is designed with a mixture of NYC’s downtown flair and Virgin Atlantic’s warmth and individuality. The lounge lives and breathes lower Manhattan – think Soho boutiques, TriBeCa lofts and Meatpacking District chic". 1 May 2012 It seems SAA are doing pretty well with their Johannesburg - New York direct flights: "South African Airways is very pleased that the enhancement of our schedule between New York and Johannesburg has received such an overwhelming response from our customers over the past year. We've seen a 25% growth year over year in passengers, with the increase in demand coming from both business and leisure travelers. The timing of the schedule, with easy options to connect in New York or Johannesburg, provides an invaluable service to our customers, allowing them to reduce their overall travel time while enjoying our legendary award-winning service on board." said SAA's executive vice president, North America, Todd Neuman. 9 December 2012. We spotted a flight from Johannesburg to New York which was R7165* (19 to 27 January 2013). Wont last long. 26 November 2012. Spotted a Johannesburg to New York flight which was R6345*, with Etihad and Alitalia, stopping in Abu Dhabi and Rome. *The longer the time which has elapsed since the date of the special, the greater the chance airfares have changed. New York's time is GMT-4 hours from early November, December, January, February to early March; and GMT-5 hours the rest of the year. In Johannesburg the time is GMT+2 hours, so it is 6 to 7 hours earlier in New York than in South Africa. Get around in New York using the subway system, as you would in Europe, with at least one ride in one of their famous yellow cabs. Have a meal at one of the little street stands. 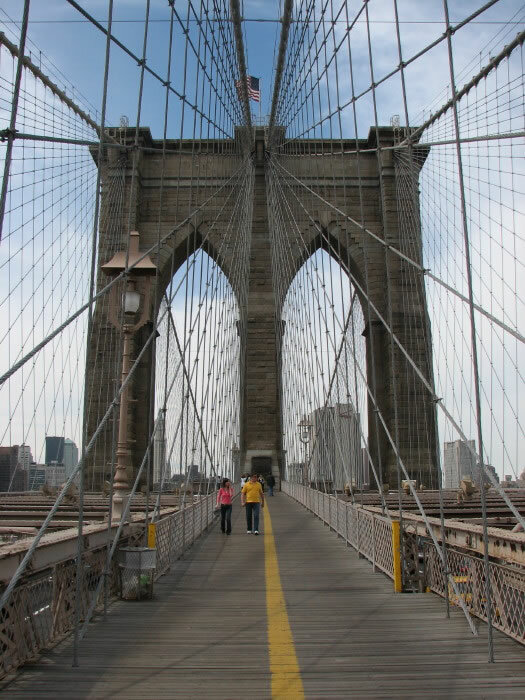 Take a walk across Brooklyn Bridge, take in the view from the top of the Empire State Building, walk through Central Park, bask in the fluorescent lighting of Times Square where you can also buy a ticket to broadway, a ferry to Staten Island, pay your respects at the Twin Towers memorial and visit Wall Street and the New York Stock Exchange.